Today I'm talking swaps! I've been a part of many block swaps and exchanges and I've loved them all. I recently finished this quilt - it's made from blocks sewn by quilters from around the country. I love the scrappy look it has and I love knowing that many talented hands went into making it. So what is a swap? 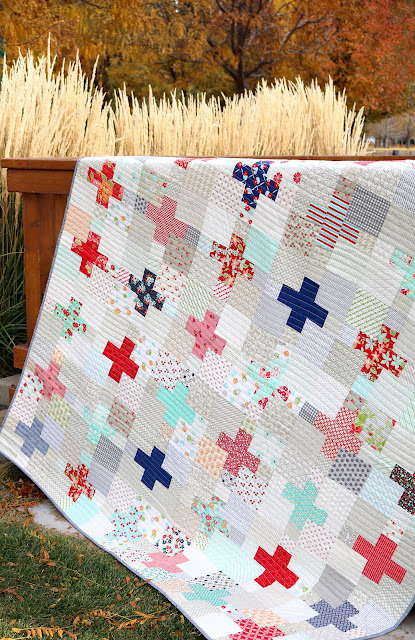 It's a way for quilters to make and exchange quilt blocks with one another. 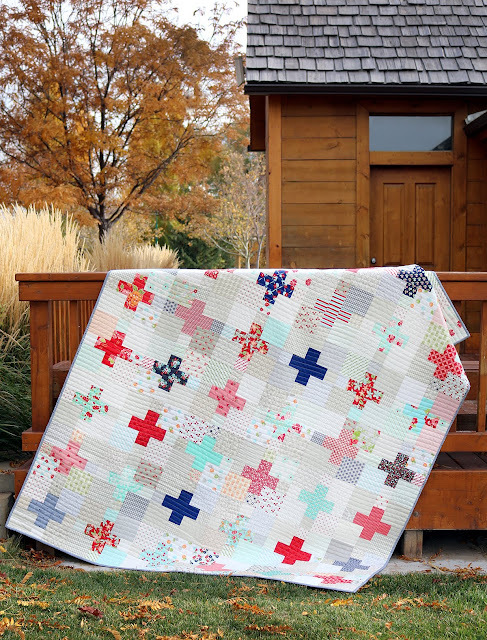 Usually the swap is set up in such a way that each quilter puts in a set number of blocks, all the blocks are put into a group or pool, shuffled and then a different set of blocks is sent back to each quilter. 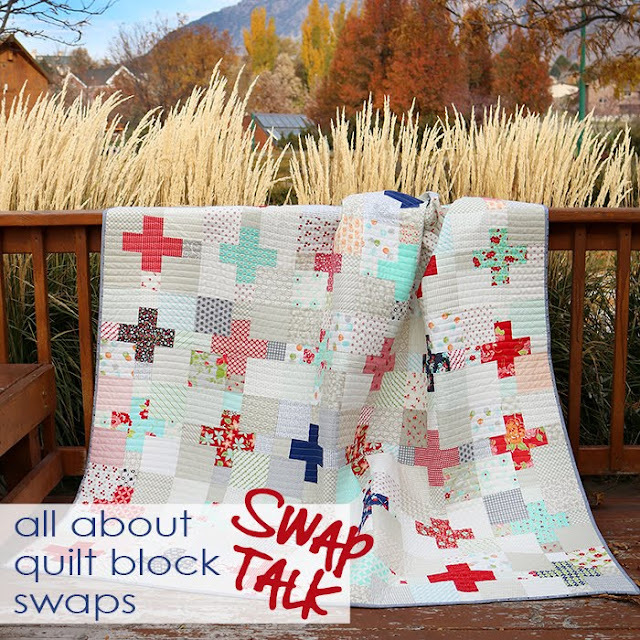 Another option is for quilters to be assigned to one another to do a direct swap - for example my blocks would go to you, and your blocks come to me. Why should I join a swap? Swaps are a great way to get a scrappy look! For this low volume plus block swap, I made 20 blocks from the same few fabrics, but I received 20 blocks made from dozens of different prints - so fun! Meet new people and make new friends. Every swap I participate in results in me gaining a new friend. 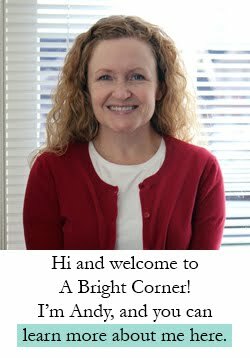 You get to swap with people from around the country - sometimes around the world! I have a quilt from 2009 that has a couple of blocks in it from Jodi Nelson (a.k.a. Pleasant Home). At the time I didn't know her, and now we're friends - even all these years later! How can I find a swap to join? 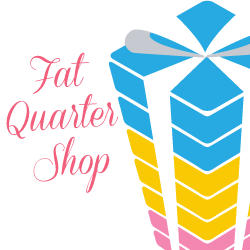 Most of the time I hear about swaps in different local quilt groups and guilds that I visit. I also hear about them online on Instagram and Facebook. 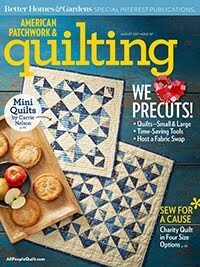 If you're looking for a swap, ask your local guild or quilt shop, and ask around online. Or...you can start your own swap! (see below for tips). This low volume plus swap that I joined was organized through instagram. We could only use Bonnie and Camille fabrics and we all followed the same plus block pattern. We could request to get certain color blocks back and I requested red, aqua and navy. I'm really happy with how the finished quilt looks! Start small - most swaps are set up so that you can send in as many blocks as you want, and you get back the same number you send in. If it's your first swap, try signing up for just a small amount of blocks, maybe 5 or 10. See how you like it! Give what you'd like to receive. 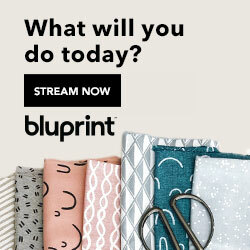 Use your favorite prints, do your best work, follow the pattern, press your blocks, package them well for shipping/trading. Think of this as the golden rule of quilting - give blocks unto others that you would want others to give to you. Don't procrastinate - Don't wait until the day before the deadline to start your blocks. Trust me on this one. You'll be stressed, and the whole experience will be a lot less enjoyable. 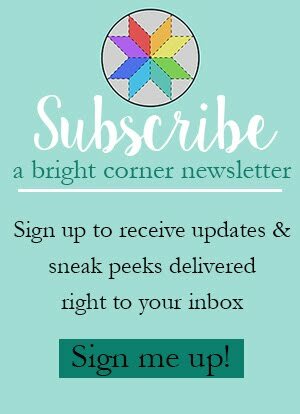 Participate in the group - if there's a way to communicate with the group (group text, Facebook group, IG hashtag) do so! Encourage others, comment on their posts, share your progress. This is where you get to know your fellow swappers and make friends. Thinking of organizing a swap? Start small - set up a swap with just a friend or two, or your local guild. Consider putting a limit on how many people can join - it could grow to an unmanageable size quickly! Have a plan - Be clear with the rules (fabric choices, block pattern, finished block size, how many blocks does each person make?) Decide ahead of time how the blocks will be swapped - will you all meet together to help swap? Or will one person take care of the swapping and then hand out blocks next time you meet? Make sure the pattern is readily accessible to all participants. 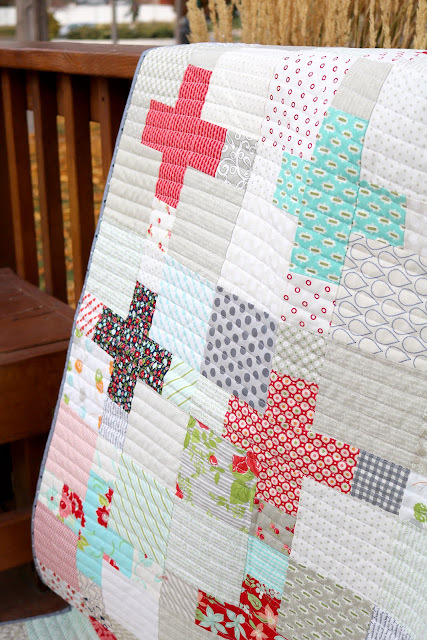 There are thousands of great block tutorials and free patterns out there! Set a deadline- Set a deadline for people to sign up by, and a deadline for people to have their blocks finished. If blocks need to be mailed, have a "ship by" deadline as well. Remember the details- If you can clearly state all details up front, you'll spend less time answering emails and messages as the swap goes. Have fun! - Give people a way to share their process, either with a hashtag on instagram or a private facebook group. Encourage members to share photos of fabric choices, blocks in progress, and definitely share the finished quilts - that's the fun part! Having a way to share will also help to motivate all group members to keep working to meet the deadline. When I see the great blocks others are creating, it makes me get my rear in gear and start sewing! Sampler blocks - everyone uses the same fabric line or the same designer but makes any block design they like that finishes at a set size (usually 12.5" square). 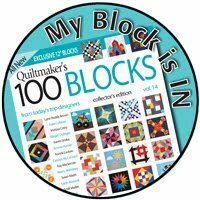 The Quilter's Cache has a great library of blocks and you can search by name or size. 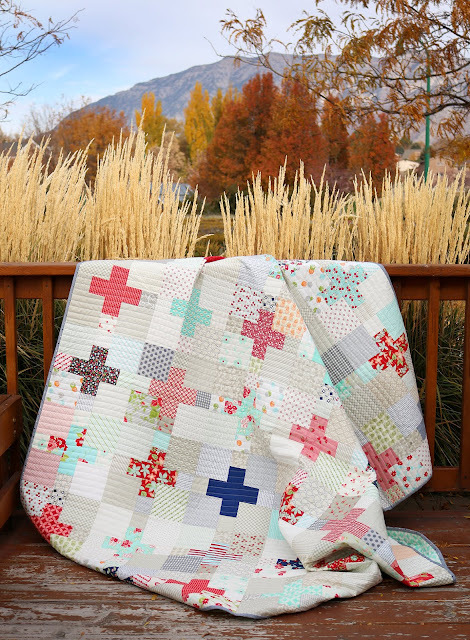 See an example of a sampler swap quilt here - gorgeous! Informative post! 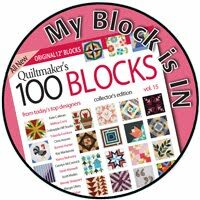 I might just have a block in your quilt! 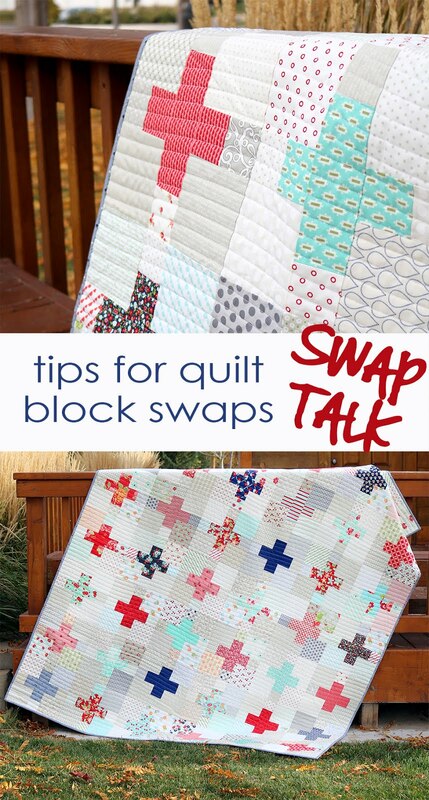 I need to work on my quilt from that swap! Thanks for taking the time to share this info. The new year could be the perfect time to get involved in a swap. Excellent post! Swaps can be so much fun.